I wanted to remind you today about the generous promotion that Head for Points and hotel booking site Kaligo.com, which awards Avios points with every hotel you book, are running this month. It is a simple, straightforward and potentially lucrative one. If you spend over £700 on hotels at Kaligo.com before midnight on Saturday 31st March, across one or numerous bookings, you will receive 8,000 bonus Avios. 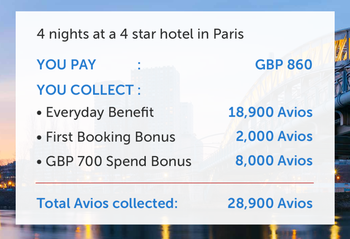 These points are in addition to the everyday benefit of 5 – 10 Avios per £1 spent you will receive for every booking all year round. Even better, if you are a new customer and have never before booked a hotel on Kaligo.com before, you will earn an additional 2,000 Avios with your first booking of any value. That makes a possible total of 10,000 Avios for new customers and 8,000 Avios for existing Kaligo.com customers in addition to the everyday Avios earned if you manage to spend £700. The stays only need to be completed by 31st December 2018. You MUST register before you book at this special HFP promotional website in order to receive the bonus. For clarity, even existing Kaligo.com customers must register before booking. As usual with such promotions, you need to check your pricing before you book. Kaligo.com is not always the cheapest place to book – it depends on the property. However, when you factor in the value of the 8,000 bonus Avios points for just £700 of spending – plus the base Avios you earn from your stay – they should be looking pretty good indeed. Remember that you will usually not earn points for your room spend in any hotel loyalty programme linked to the property you book if you use Kaligo.com (or indeed any third-party hotel booking site). Depending on the hotel, you may receive status benefits or points for your food and drink spend. This offer runs until midnight on Saturday 31st March 2018 although your stays can be at any time in 2018. I would start to think about your hotel plans for the next few months and see if you can find £700-worth which you can divert to Kaligo.com! Remember that you do NOT need to spend the full £700 in one booking – it can be across numerous bookings. Remember that you MUST register in advance via this page on the Kaligo.com website. It is fair to say that Kaligo.com’s customer service is excellent – their representatives even pop up on social media to answer queries – so you should have no concerns at all about your bonus posting properly. The company is also very punctual at posting your Avios posts once you have checked out. Thanks to the team at Kaligo.com for making this exclusive deal available to Head for Points readers. It’s so annoying that these deals have a ‘stay by’ date. Surely as long as you pay the money up front, it shouldn’t matter when you stay. We tend to book our hotel accommodation at the time we book our flights. The only hotel I still need to book is for early January next year in AUH. It’ll be well over £700 and I’d be happy to pay now, but I’ll still fall foul of this deal for the sake of a fortnight! Go for the free cancellation option, so you qualify for the offer but if you need to change plans after you book your flight, you dont lose out money, rather the chance to get the points as a backup option. I also noticed that my British Airways has miles but my Avios is showing none, do they need to tally up? Do they work as separate programmes? Im confused! Hi Jeff. Avios is the “currency”, BAEC, avios.com and Iberia+ are the “banks”. Your balances in each bank will be different. The currency can be transferred between “banks” to make it all in one place. Give your BAEC number for the Kaligo offer as it is them with whom the offer is running. Remember that each program is separate for points expiry. So even if you regularly earn points in one account you can loose your points left in the other account if you have not earned any points on that program for 3 years. “Bookings need to be guaranteed by advance payment” – so you can’t get the free cancellation option on this. I did a dummy booking quote and it is showing up with the bonus 8000 points and 2000 new user points? That’s right, if you are a new user. When I used Kaligo to book previously I had a bit of a nightmare claiming my expenses. This was due to the fact that the booking essentially generated a voucher which the hotel took off my bill. It prevented the hotel generating a final invoice with the full bill on it and indicating it as paid with a 0.00 balance. Has anyone else had this issue or had the ability for the hotel to generate a zero balance bill. Because of the problem i’ve only booked once so wonder if it was more the hotel than Kaligo? You rarely get a VAT receipt with these 3rd party sites because they tend to dodge it, making the booking on behalf of a non-UK registered company. Hotels.com is the same. Not an issue if you’re the boss – your accountant won’t care if all you have is a Kaligo receipt – but tougher if you work for a corporate. i have really tried to use this offer, i have 3 trips coming up, booking hotels for all of them….BUT 10,000 Avios is worth what, £ 100 ? every time i look the Kaligo prices are > £ 100 more expensive than booking.com, am i wrong ?? It is all hotel by hotel. If you can get it to work then fine, if not you can’t. A small business owner would also get the £100 price gap down to £60 due to the tax shield which would make it a decent deal. Pretty good timing, have 4 days in HKG coming up. I guess IHG for ambassadors don’t get their benefits though…. You can get receipts but yes they are indeed not full VAT receipts. That said, if like me your work doesn’t require full VAT receipts it’s proved to be a pretty decent. @Neil – What CC did you use to get the 1,800? Works out to be 2.5 Avios per £1? You need to physically pay Hilton to trigger it so that it appears on your credit card statement as such. If you book via a 3rd party it will show as booking.com, expedia, hotels.com etc so you will not get the £50. Remember that you won’t get any Hilton points or benefits via an online travel agent (eg free breakfast if Hilton gold), only if booked direct. Will only work if booking.com let’s you pay at the hotel. Beware if you select the EUR currency I see the bonus was 4200 Avios for EUR950 spend so thats 4.4 Avios per EUR. How you’d get 10 Avios per £1, should have switched to GBP currency?